By Kori ~ April 24th, 2013. During my media trip to Chile last fall, I had the opportunity to visit many of Chileâ€™s wine regions, meet many of the movers and shakers in the Chilean wine industry, and taste many of their wines.Â Since returning home, I have continued to explore the wines of Chile. Recently, I had the opportunity to taste yet another Chilean wine in a blind samples tasting, the 2010 Apaltagua Signature Cabernet Sauvignon from the Maipo Valley. ViÃ±a Apaltagua, founded by American businessman Edward Tutunjian, produces 235,000 cases annually, which are exported to 40 different countries. The Maipo Valley spans from the Andes to the coast and is one of Chileâ€™s oldest and most well-known wine regions. Best known for its red wines, the Maipo Valley is the closest wine region to the city of Santiago. The climate in the Maipo Valley is marked by two distinct seasons, the winter is cold and rainy and the long summer is dry, hot, and sunny. Cabernet Sauvignon is Chileâ€™s star grape with over 40,000 hectares planted, accounting for 47% of all red varieties planted. While it is grown in all but the coldest areas of Chile, Cab does best in regions with a warm, dry climate that allows it to fully ripen. 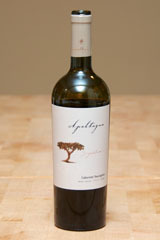 2010 Apaltagua Signature Cabernet Sauvignon (Maipo Valley, Chile): Deep, dark red in color. Very aromatic with red fruit, spice, vanilla, and smoked meat on the nose. Cherry, strawberry, and a touch of tobacco and chocolate come through on the palate. Medium to full-bodied with lively acidity, medium to high tannins, and a long, smooth finish.